Braving winter’s nip, with scarf, gloves and determination I ventured out. My destination was West Fest Dance Festival at the Merce Cunningham Studio in WestBeth. I had been hearing a lot of buzz about the dance festival and was ever so curious. I can honestly say that it was indeed a treat and very festive! WestFest Dance Festival is the product of the hard work of Carol Nolte and Kirstin Kapustik. Carol Nolte is a choreographer and dance producer for nearly 40 years, a WestBeth resident and a member of the WestBeth Artists’ Residence Council. Kristin Kapustik is a choreographer, teacher, producer, and arts administrator. 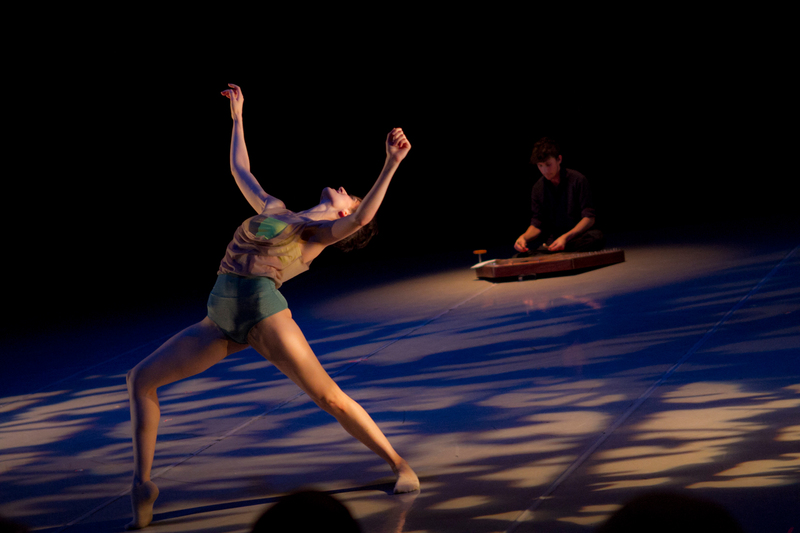 WestFest Dance Festival brings together choreographers and Dance Artists from NYC and abroad, presented at the Cunningham Studio Theater in WestBeth Home for the Arts. The evening offered eleven choreographers the opportunity to present their work. I would like to highlight a few of those. 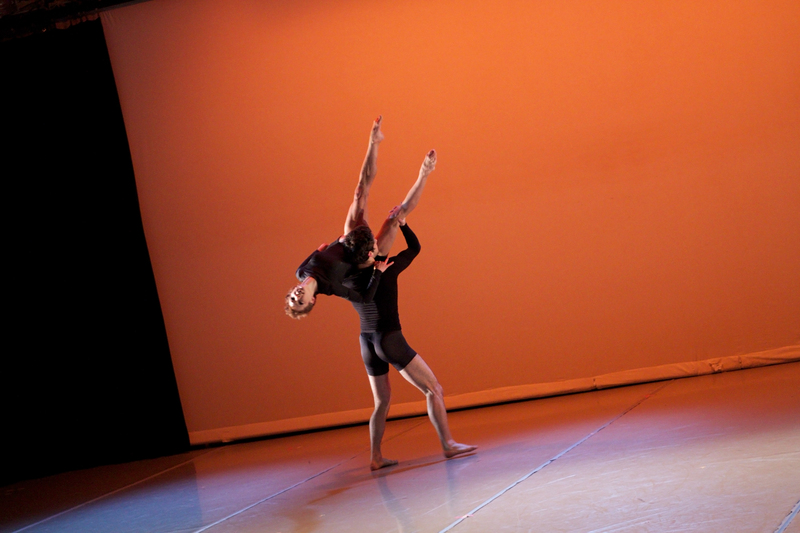 First up was Duet from “Station”, choreographed by Eve Chan and danced by Morgan Hurst and Ben Freeman. 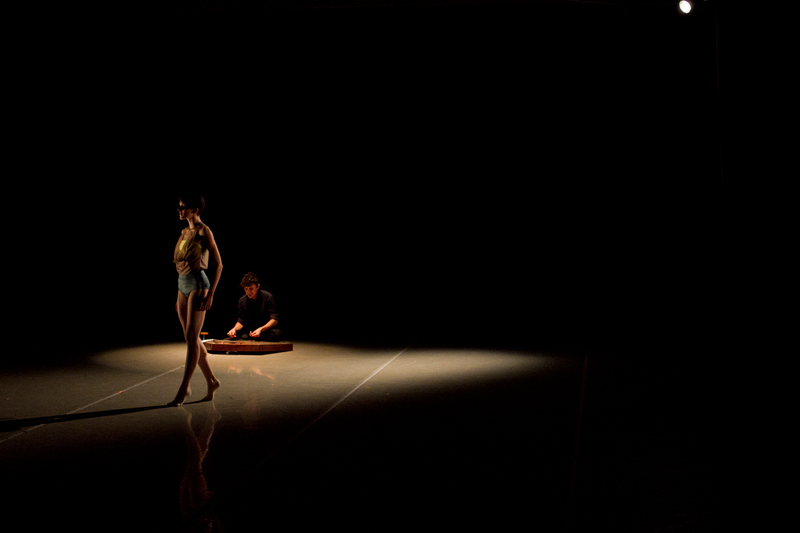 The choreography was strongly abstract and beautifully danced. Mr. Freedman is a strong partner and a perfect contrast to Ms. Hurst. Ms. Hurst must be lauded for her rare quality of movement and sheer majestic on the stage. This piece has lingered in my mind, I am hoping it is an evening long work and if not it should be developed into one. Ms. Chan’s choreography held me transfixed and at its finish, left me wanting more. Five Minutes (excerpt) choreographed by Amanda Selwyn and dancers, with music by Vollomand and Ahn Trio with costumes by Anna-Alisa Belous is one of my favorites of the night. The program notes states “An evening-length work, Five Minutes will take audiences through a series of contrasting emotional and physical paradigms set in five-minute intervals. The piece will ask: What does it mean to wait for five minutes? To fill five minutes? How is time measured differently by our experiences and expectations? The movements will speak to these questions in extended limbs, physical risk, desire, energy, release, touch, and balance”. There were two excerpts, Five Finger and Oblivion. Five Fingers held me entranced, it began mysteriously with six dancers each slowly moving and assuming varied poses, then as a group began blending motion and music, unhurriedly. Five Fingers possessed an almost ritualistic quality, with fluidity and passion of movement that was so expressive in its simplicity. Ms. Selwyn vision is unique and original. It held me transfixed. Oblivion, the second excerpt from Five Minutes was a duet. It possessed almost a tango-like quality in its intensity and underlying sensuality, the dancers expressing the fluidity and lyricism of the choreography superbly. Louie Marin must be mentioned for his blend of passion and commitment to his dancing. Kristin Kapustik’s on the porch was something of surprise for me. It is a duet for Kit McDaniel and Stephanie Mas, who were wonderful in establishing a relationship of silent co-dependence, seeking an independence from the other but afraid or reluctant at the same time. There were glimpses of hesitancy and assuredness and positive reinforcement by the touch of a hand or gesture of tenderness. It began as if one dancer wanted to hide the truth or seek to protect the other by covering their eyes as if by blindfold. The piece possessed a certain innocent, a truth. Was it a sisterly relationship or something more romantic in nature? Giorgia Ecstasy choreographed by Robin Cantrell with live music by Max ZT and costumed by Anna Love must be mentioned. This was a seductive solo, danced to perfection by Giorgia Bovo. Ms. Bovo is a long-legged beauty who held us like putty in the palm of her hand throughout the dance. The piece took a moment to get started but once it did, WOW! Ms. Bovo danced with exquisite movement and a haunting serenity. Max ZT, known as the Jimi Hendrix of the Hammered Dulcimer grabbed our attention from the start. His virtuosity on the Hammered Dulcimer, which I had never witnessed live, was like candy to our ears, delicious. The combination of Max ZT and Giorgia Bovo was brilliant and is loudly applauded. Ms. Cantrell’s choreography wove them into a tight and powerful performance. 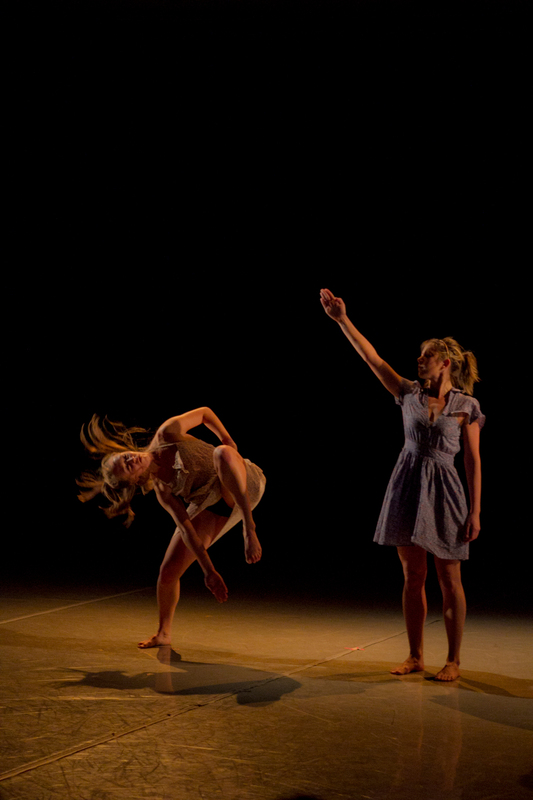 See You Around choreographed and performed by Claire Porter and Sabatino Verlezza was sheer genius. With text by Claire Porter, they took the every-day occurrence of two business colleagues that meet in an elevator and turned it into parody. First they established the parameters of the elevator with red tape and then the fun began. Each in business attire and carrying file folders in their arms Ms. Porter calmly asks Mr. Verlezza if he has seen Bob around. They enter and exit the elevator several times, each seeking information and the where about of present or past colleagues. It’s a brilliant comedic piece about the everyday live and occurrences in the work place. Herd Instinct choreographed by Diane Cahill Bedford I must mention for the outstanding performances of Sheila Cox and Bryan Peck. The eye is drawn to Ms. Cox for her natural stage presence and Mr. Peck danced with such commitment and mastery of his movements that both were a joy to watch. I knew that Take Dance was performing and the reason I choose to come on this night. I wanted to see The Game, a section from Salaryman, which is a full length work. I become aware of Take Dance because of the upcoming performances of FIVE POINTS – TAKE Dance + PULSE: Part II Collaboration with PULSE Music Ensemble at the Cunningham Studio, .Dec. 15 – 17, which I am seeing Saturday. I had seen a video or two from Salaryman for the Take Dance website. So I thought I had a fairly good idea of what to expect. Well, I didn’t. If I had a hat on my head the sheer intensity of this performance would have blown it off. Takehiro Ueyama is purely a force of nature. 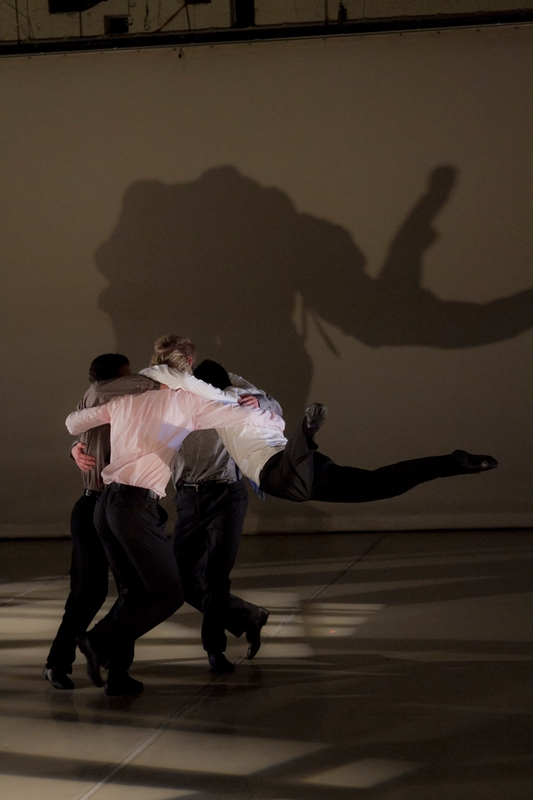 The Game is a quartet for four men, John Elrich, Kile Hotchkiss, Clinton Edward Martin and Kei Tsuruharanti, who danced with such virtuosity they must be mentioned. There were so many leaps, turns, jumps and athletic adroitness that it was exhausting (but in a good way). Mr. Ueyama, who was born and raised in Japan has undertaken the plight of Japan’s “salaried businessmen who toil through a repetitive daily cycle that rarely changes” for the focus of Salaryman. Attired in business suits they exhibit the toil, frustration, and drive to exceed, and the furious, brutal race to the top of the corporate ladder. They use their ties to imply they are hanging themselves from over-work, a universal theme relatable to many. 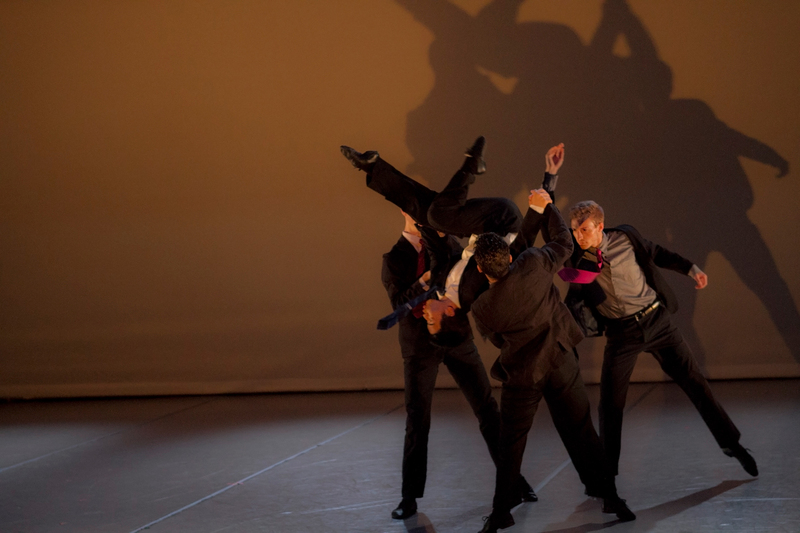 Salaryman may be seen in its entirety at The Nagelberg Theater, Baruch Performing Arts Center, NYC, Feb. 8–11, 2012. Much is the concern for the plight of the Merce Cunningham Studio. Widely known as the birth place of so many of Merce Cunningham’s works its fate is unknown. The Cunningham Studio is a cultural landmark that needs to be preserved. By losing it, we loss a landmark so important to the history of modern dance, an affordable performance space for emerging artists and a beacon for young talent world-wide. Posted on the studio website Please note that due to the Cunningham Dance Foundation’s planned closure, the Studio Performance Program for Young Artists will conclude on February 26, 2012.